The 50th Anniversary of the Sgt. Peppers Lonely Hearts Club album. 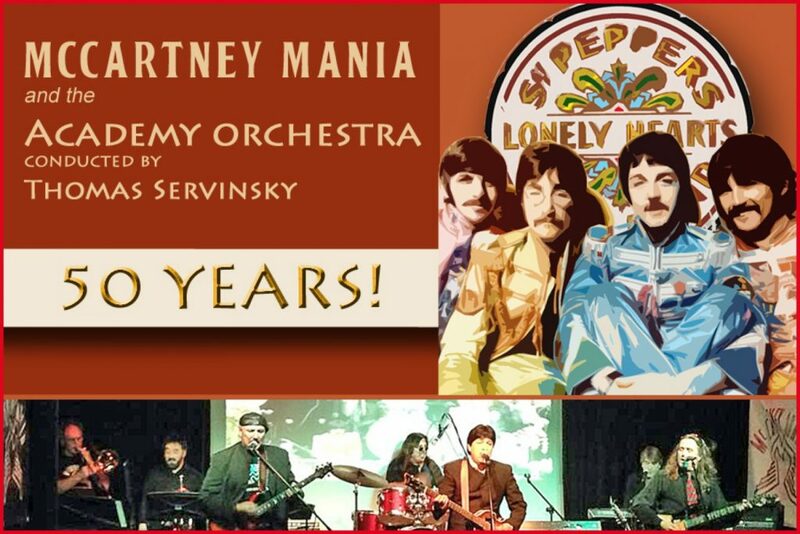 McCartney Mania, one of South Florida’s most popular Beatles Tribute bands, along with the Academy Orchestra, come together in this symphonic/rock extravaganza celebrating the 50th Anniversary of the Sgt. Peppers Album. Experience this rare opportunity to see the entire album performed live from start to finish. Under the direction of Thomas Servinsky, the Academy Orchestra once again, shares the stage with McCartney Mania celebrating the music of the Beatles. The Sgt. Peppers album is considered by many, as the most influential album ever made. Never has one recording made an impact on the world of music as Sgt. Peppers. Not only were each of the songs unique in their form and structure, but layered with never attempted sound recording techniques, this one album became the standard for which all other albums are measured by. Still after 50yrs, the Sgt. Peppers album still remains the gold standard. All arrangements and orchestration for this collaboration are by Thomas Servinsky, the Academy Orchestra’s conductor and director.